The octopus may look like a fleshy enchanted dishrag, but they're jerks. They're such jerks that they're often housed individually to prevent cephalopod murder and are pretty much only social when mating. These invertebrates really show their sensitive side, however, with a little MDMA. We know this because scientists gave octopuses the drug you might know as molly or ecstasy or X or E. They did this because that's what scientists do and also to learn more about the similarities between our extremely dissimilar brains, which are "separated from humans by more than 500 million years of evolution." The findings of the study were published in Current Biology and revealed octopuses so social they were "essentially hugging." Which is big a step when the baseline is "literally murdering." "They have this huge complex brain that they've built, that has absolutely no business acting like ours does -- but here they show that it does," Judit Pungor, a neuroscientist at the University of Oregon, told NPR. "The fact that they induced this very sort of gentle, cuddly behavior is really pretty fascinating." In the experiment, a hand-sized octopus was placed in the middle section of a three-chambered tank after soaking MDMA through its gills. In one chamber was a colorful object; on the other was a second octopus in a cage (the cage was to prevent it from being murdered). The sober octopus preferred the object. The stoned octopus hung out with and even hugged the other octopus. The octopus originally had a much larger dose to see if the drug had any effect, and it had a very bad time. "They were just taking these postures of super hypervigilance," Gul Dolen, a neuroscientist at Johns Hopkins University, told NPR. "They would sit in the corner of the tank and stare at everything." Once the dose was lowered to a more reasonable amount, the cephalopods had a much better time. Dolen came up with the idea to give eight-limbed monsters a party drug after the full genetic code of the California two-spot octopus was sequenced. 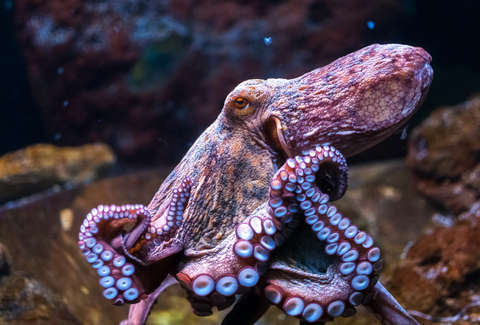 Her lab had already been studying MDMA, and once it was revealed that an octopus has identical genes and proteins that allow MDMA to change serotonin levels in the human brain, they wondered how the friendly-making drug would affect the unfriendly octopus. Now we know for sure that is has some effect. Some expressed doubt that this is genuine affection, but the study does suggest that "serotonin has been encoding social functions for a very, very long time. At least 500 million years ago, it started doing this function," according to the article in Current Biology. "It just shows us how much we don't know," Zachary Mainen, a neuroscientist at the Champalimaud Centre for the Unknown in Portugal, told NPR, "and how much there is out there to understand."